A Glasson Guide leader was thanked for 50 years service to Guiding during Irish Girl Guides’ recent west and central Midlands regional conference. 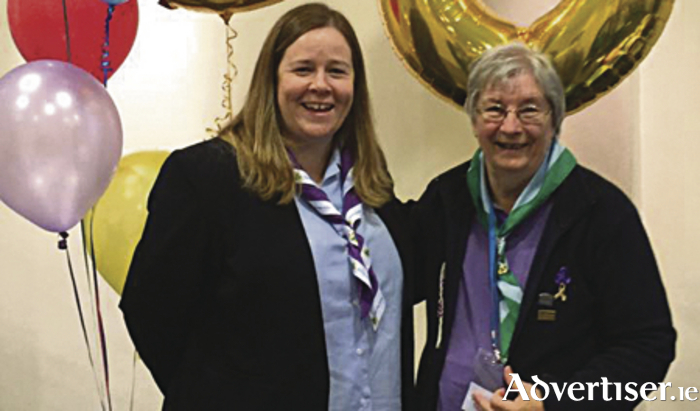 Grace Grouden, who is a leader of St Ciaran’s Guides, which meets each week in St Mary’s Hall, Athlone, was thanked for her “huge service and dedication” by Irish Girl Guides (IGG ) chief commissioner, Helen Concannon. She described Grace as “a super role model for IGG members of all ages”. Grace said guiding became “a way of life” for her. She especially enjoyed camping trips. As well as attending various international Guide camps in Ireland throughout the years, she has also represented IGG at events in England, the Isle of Man, Austria, and Switzerland. Grace, who is an outdoor adviser and district commissioner with IGG, also served on IGG’s National Outdoor Committee 20 years ago. Grace’s daughter, Brenda, is a leader with Glasson Guides and she has three granddaughters involved in IGG too – a Brownie and Ladybird in Glasson and a Brownie in Roscommon. For more information on Irish Girl Guides visit www.irishgirlguides.ie or call (01 ) 6683898.